Support me (only 2$/month) at: Patreon. In astronomy, the Pleiades (/ˈplaɪədiːz/ or /ˈpliːədiːz/), or Seven Sisters (Messier 45 or M45), is an open star cluster containing middle-aged, hot B-type stars located in the constellation of Taurus. It is among the nearest star clusters to Earth and is the cluster most obvious to the naked eye in the night sky. The celestial entity has several meanings in different cultures and traditions. The cluster is dominated by hot blue and extremely luminous stars that have formed within the last 100 million years. Dust that forms a faint reflection nebulosity around the brightest stars was thought at first to be left over from the formation of the cluster (hence the alternative name Maia Nebula after the star Maia), but is now known to be an unrelated dust cloud in the interstellar medium, through which the stars are currently passing. Computer simulations have shown that the Pleiades was probably formed from a compact configuration that resembled the Orion Nebula. Astronomers estimate that the cluster will survive for about another 250 million years, after which it will disperse due to gravitational interactions with its galactic neighborhood. • Optics: Takahashi FSQ-85EDX super apo (quadruplet 85/450). • Mount: Skywatcher N-EQ6 Pro. • Filters: Astronomik LRGB (36 mm). • Accessories: QHYCCD QHYCFW-2-M motorized filter wheel. L: 120x60s | binning 1×1 | Gain 120 | Offset 80 | cooled -20°c. R: 10x60s | binning 1×1 | Gain 120 | Offset 80 | cooled -20°c. G: 10x60s | binning 1×1 | Gain 120 | Offset 80 | cooled -20°c. B: 10x60s | binning 1×1 | Gain 120 | Offset 80 | cooled -20°c. Notes: Mapped LRGB, maybe RGB filters not in focus as well, not polar alignment, moonlight. © www.infinitalavita.com • Cristian Cestaro. 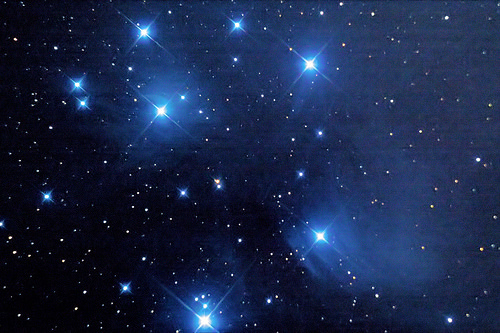 The Pleiades (also known as the Seven Sisters and Messier 45). This is one of my favourite autumn targets and one I feel compelled to image every year in order to try and improve on previous attempts. Their rising heralds the arrival of the constellation of Orion which pursues them. I love the mythology associated with the Pleiades and Orion and different cultures have their own stories to explain them. M45 always seems like it should be a fairly easy object to image and it is, however processing it is another matter. This image was made over two nights (24/09/18 and 03/10/18). The original idea was to capture all the data in one night but the first night, although being very clear, was a full Moon and many of the subs were washed out making processing a nightmare. The second night the Moon wasn’t an issue but conditions were still less than ideal and we were shooting into a murky sky with high cloud. Ultimately I combined the best shots from both nights and this is the result…by no means perfect but as good as I can get it, not too noisy and a reasonable amount of nebulosity coming through. 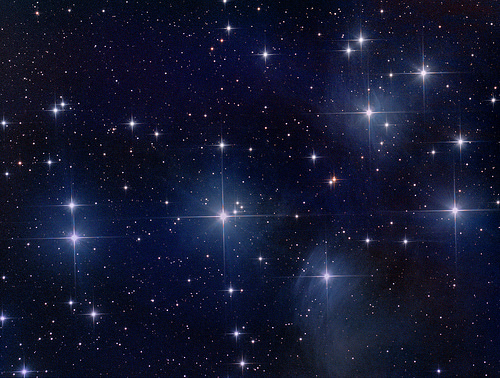 The Pleiades are an open star cluster containing middle-aged, hot B-type stars located in the constellation of Taurus. It is among the nearest star clusters to Earth and is the cluster most obvious to the naked eye in the night sky. The cluster is dominated by hot blue and luminous stars that have formed within the last 100 million years. A faint reflection nebulosity around the brightest stars was thought at first to be left over from the formation of the cluster (hence the alternative name Maia Nebula after the star Maia), but is now likely an unrelated foreground dust cloud in the interstellar medium, through which the stars are currently passing. 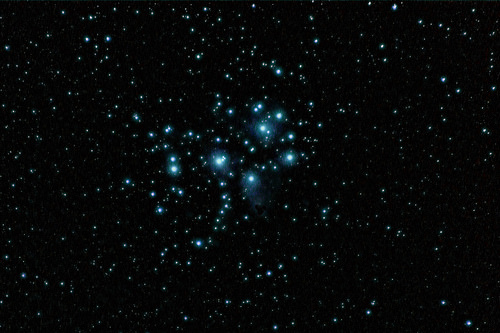 Computer simulations have shown that the Pleiades were probably formed from a compact configuration that resembled the Orion Nebula. Astronomers estimate that the cluster will survive for about another 250 million years, after which it will disperse due to gravitational interactions with its galactic neighborhood. 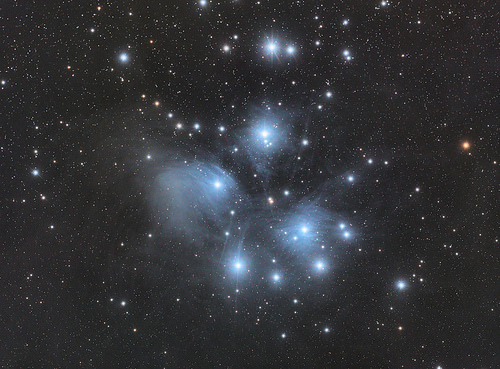 The Pleiades (M45). This is a shot I’ve been wanting to do for a long time. Previous attempts were unsatisfactory because my 127 Mak has too much focal length for this object and looked straight through it and using a camera lens made unattractive spokes around the stars caused by the iris of the lens. With the 150mm Newtonian scope the framing is pretty much perfect and plenty of nebulosity can be captured. Also the spikes caused by the secondary mirror spider add to the image. Not perfect perhaps but definitely the best attempt so far. This image has been edited sine originally being posted with extra data added and flat files replaced. [Wikipedia] In astronomy, the Pleiades, or Seven Sisters (Messier 45 or M45), are an open star cluster containing middle-aged, hot B-type stars located in the constellation of Taurus. It is among the nearest star clusters to Earth and is the cluster most obvious to the naked eye in the night sky. 68 x 75 second exposures at 400 ISO (one hour and 15 minutes integration time). Session: 08 Dec 2015 , 23:38. Sorry this photo is taken with fog. Skywatcher Black Diamond, 250/1200 (f4.8) | Newton – EQ6 Pro | Refractor 80/400mm (f/5) | CCD (Orion StarShoot AutoGuider) | Filter: Omegon Filter Light Pollution 2". Canon EOS 550D Reflex camera (not modified). Lights: 9x120s | ISO 400 | 18 min of integration. Darks | Flats | Dark Flats | Bias: 11 | 11 | 11 | 11. DeepSkyStacker | Adobe Photoshop CS6. Some on sale here –> Shutterstock – Fotolia – Istockphoto – Dreamstime. 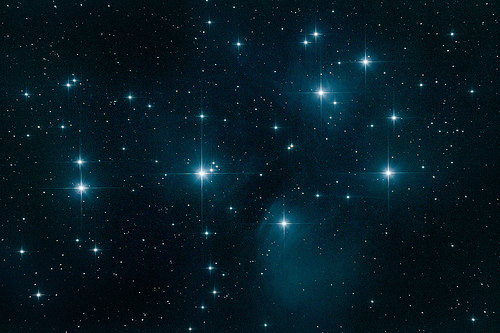 The Pleiades, or Seven Sisters (Messier 45 or M45), is an open star cluster approximately 444 light years away from Earth containing middle-aged hot B-type stars located in the constellation of Taurus. It is among the nearest star clusters to Earth and is the cluster most obvious to the naked eye in the night sky.